Présentation annonce de vacances Haute Garonne - Toulouse : luxury flat to rent. Annonce location vacances Haute Garonne. Annonce location Appartement vacances Haute Garonne. Vacances Toulouse. Two-rooms flat bedroom + bathroom/toilet with shower + living/dining/kitchen quiet street near the center of the town view on a little exotic garden washing machine-dish washer- micro waves- regriferator - deep freeze- coffee maker - kettle - toaster - mixer TV set (>20 inches) - VCR - CD/DVD player- satellite connexion foreign chanels - ADSL internet wifi toilet and bed linen supplied stay: 3/6d-week-month informations about use of all equipments in french and in english. 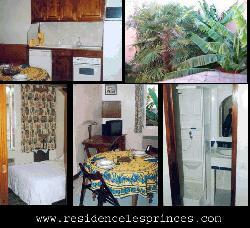 Annonce Location Appartement Vacances, capacité 2 personnes maximum. Annonce location vacances Toulouse : luxury flat to rent.